Had fun making up another Bison meatloaf for dinner. Served it with butternut squash risotto (there are some great organic boxed risotto’s out there for quick side dishes! ), green beans drizzled with extra virgin olive oil/black pepper and organic cranberry sauce. Mix everything up by hand in a large bowl. 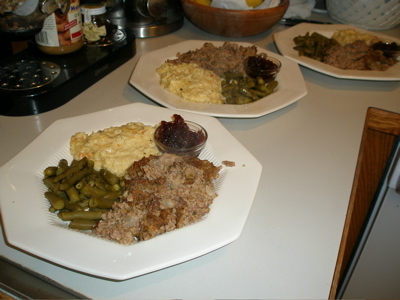 Spread in a 8×8″ glass pan. Bake in a 400* oven for an hour or so. This is not a stiff meatloaf, rather it is soft and is scooped rather than cut. If you want it dryer, add double the bread crumbs. Next Post Is It Yakisoba? Lo Mein? Pan Noodles? Tasty No Matter What….